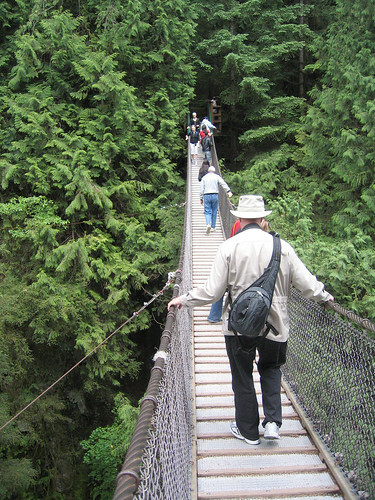 On Friday, we headed into North Vancouver to Lynn Canyon Park where they have a suspension bridge over the canyon. 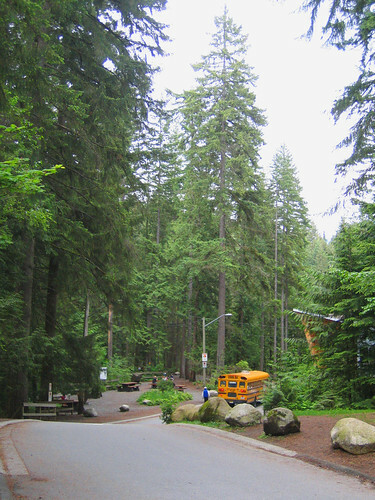 Various school classes were roaming about, doing whatever it is that they do on field trips, and I snapped the above picture of the school bus near the entrance to giv e fellow easterners an idea just how tall the trees are out here. It’s quite impressive really. 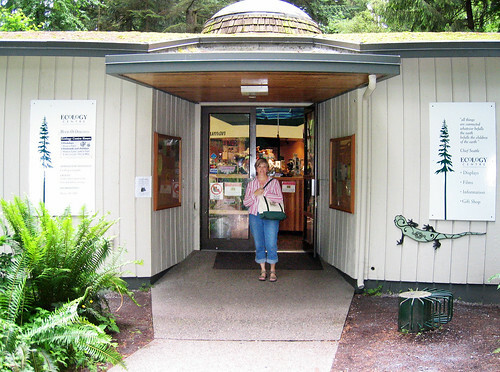 Of course, before we got that far, Cuppa had already hit the gift store (below) and just about cleaned them out, almost before I was out of the car. She was a woman on a mission, let me tell you. Now, I’m not exactly a high-wire type of guy. For example: this apartment is on the fifteenth or eighteenth floor depending on whether you accept Althegal’s or Puff’s math. The point, however, is that we are high up, and I don’t much like it. If a silly moment finds me close to the window, I find myself stepping back. So, as you can see in the photo below, I was hanging on tightly as I navigated the crossing. On the return trip, however, I was a little more relaxed and was able to find the wherewithal to take this picture of the canyon. 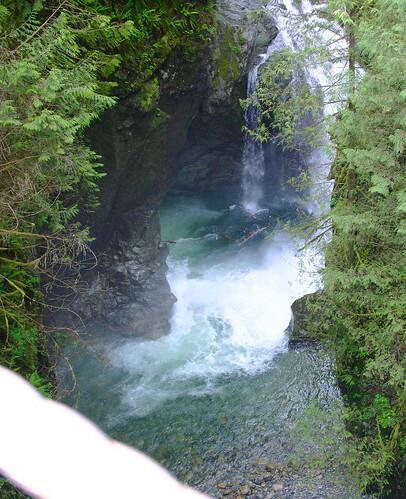 I deliberately left the railing wire in the photo as something near so that we could get an idea of just how deep the drop was, but it didn’t work out very well. Indeed, it was further down than it looks in the photo. 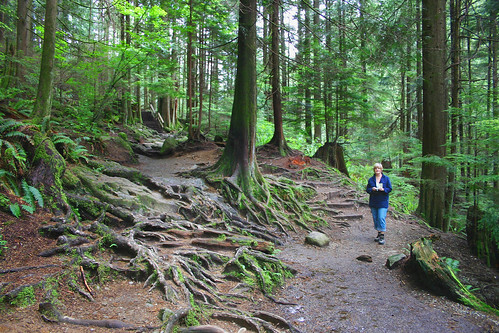 The next two pictures are of our walk in the forest as we descended the canyon to its floor. The first picture shows the tree roots (and Cuppa) and the second shows Cuppa peering into the pool of water where the stream poured out of gorge. The beauty of this place takes my breath away. You’re far braver than I. I wouldn’t have set foot on that bridge (or any bridge if I can avoid it). Oh my goodness, those pictures are so breathtaking. WOW! 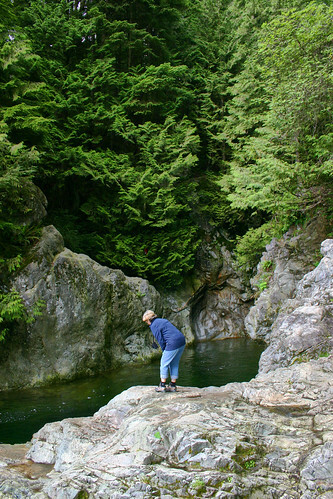 I have heard the Vancouver area is stunning, and here are your pictures to prove it. I’m not afraid of heights, but yikes! Not sure if I could’ve done that! BTW….I’m sorry I’ve been an absent commentor lately…birthdays and house renos have been keeping me busy!